Take it slow and keep both hands on the wheel since last night’s wintry precip and flash freeze has made black ice likely for this morning’s commute, especially in Barren, Edmonson and Allen Counties. Meanwhile, bundle up because the cold pattern continues with highs only reaching the upper 30’s for today and upper 20’s for tomorrow. After starting the day in the low 20’s, we will warm above freezing by around noon, halting our black ice concerns. Our temperatures will briefly reach the upper 30’s under mostly cloudy skies. Flurries are possible under cloudy skies this evening before our temperatures bottom out in the pipe-freezing low teens, with some of us even in the single-digits! Bundle up for tomorrow morning as temperatures in the teens and light winds will make it feel like the single digits. Afternoon highs will only reach the upper 20’s, but at least it will be sunny due to the high pressure system sitting over us. It might be in your best interest to leave your facets dripping again on Friday night as lows will once again dip into the teens. Bid your fond farewells to the sun for a couple days… both Saturday and Sunday look to be gloomy and chilly with highs in low 40’s. 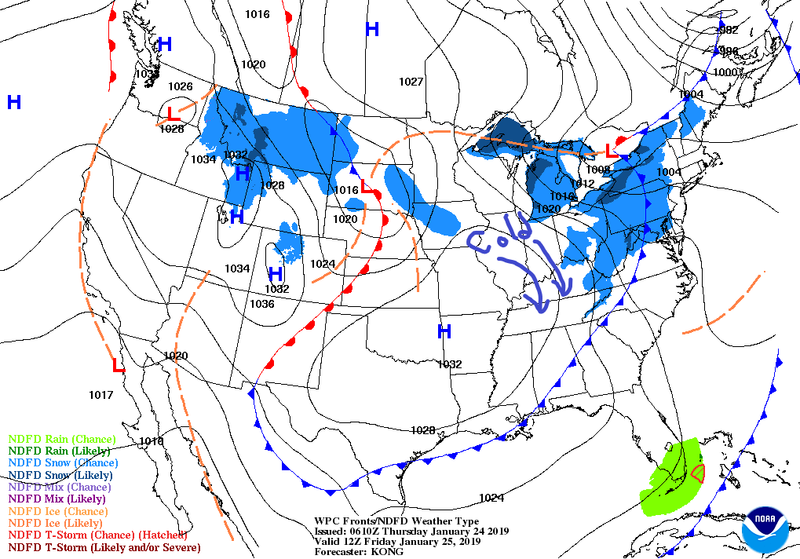 A weak low pressure system looks to cross our region overnight Saturday providing us a chance for some light snow showers. Any accumulations from this chance of snow will quickly disappear come Sunday morning. The latest guidance indicates that Monday will have above average temperatures before a strong cold front pushes through leaving truly Arctic conditions (several days with temperatures below freezing) for late next week. It is too early to speculate if the cold front will be accompanied by accumulating snow, but we will keep everyone posted. The Climate Prediction Center is 90% certain next week will be very cold. That’s all I have for today. Watch out for any black ice slick spots this morning, and follow @wxornotbg for the latest updates.